We can roughly divide games into “decision-making games” and “skill games,” with the latter group including dexterity games, speed recognition games, memory games, etc. – any sort of game where the primary focus is on a specific mental or physical skill. While there are certainly games that straddle the categories (Mamma Mia being a good example) most pretty clearly fall into one or the other. With the exception of a few dexterity games, skill games used to be mostly aimed at children and/or party gamers. In the last ten years or so more and more have been aimed at the family or even the adult gamer market, e.g. 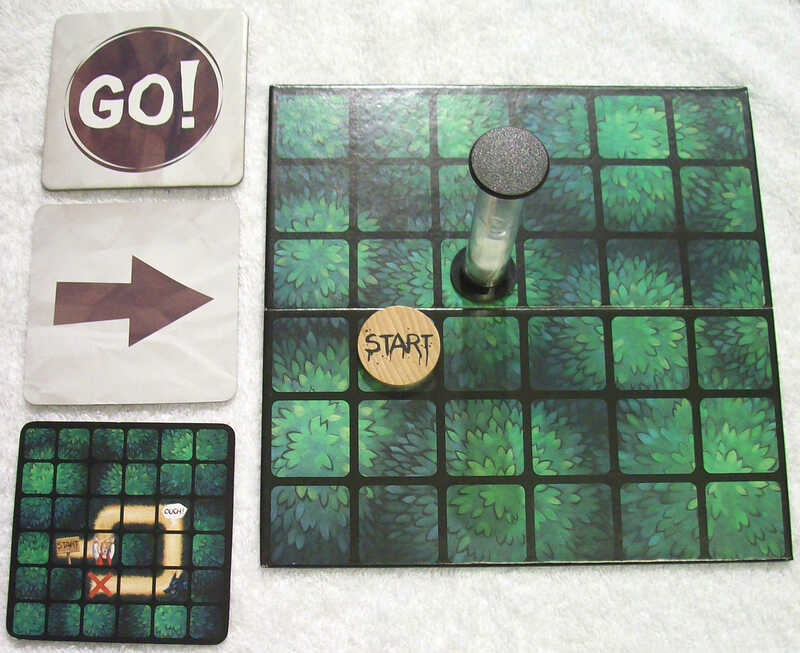 Spot it!, the various Ghost Blitz games, puzzle games such as the Ubongo games, etc. Not many have been focused on memory, so that might be a relatively untapped vein of game ideas. In order to escape you have to follow a path which is shown on a card. You can’t see the card; instead your guide (i.e., the next player) looks at it and places a token and a 30-second timer on a blank grid to show your starting location. You use two tiles to move – you rotate the arrow tile to show which way you want to go and slap the “Go!” tile to actually move. If you stay on the path your guide moves the timer in the indicated direction, otherwise you are lost and the timer goes back to start. Near the start of a typical turn. Furthermore, there are various kinds of traps along the path. Some require actions, e.g. to get over a hole you have to jump in your chair, while others require grabbing one of the three large foam objects included with the game, e.g. 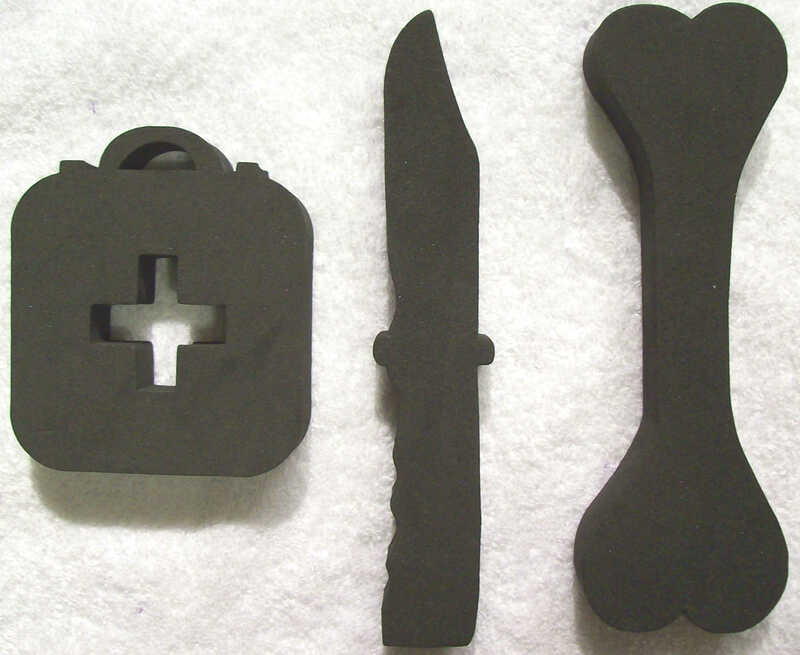 to distract a wolf you need the bone. If you don’t perform the action before entering a trap space you go back to start. Large and squishy defense mechanisms. Since you have no idea where the path is or what traps are on it at the start you will go back to start a lot. You won’t get out in one turn, which is fine since once someone gets out the game is over at the end of the round; after your 30 seconds is up you try to remember what you’ve done so far until it’s your turn again and you get to start over. 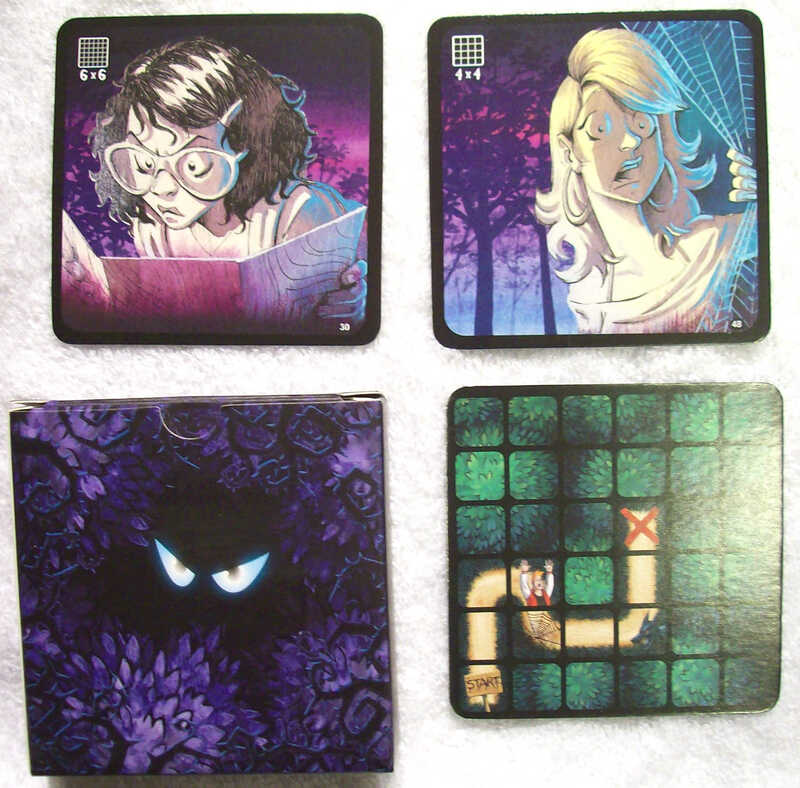 The game comes with two sets of cards: one set uses a 4×4 grid and is recommended for younger players or a larger group, while the other set uses a 6×6 grid. With four or six players you can play in teams of two, switching players whenever you have to go back to start. The game comes with its own tuckbox. No sleeves, though. So: the game works. This is higher praise than it sounds because there are plenty of games, including light skill games such as this, which really don’t work. 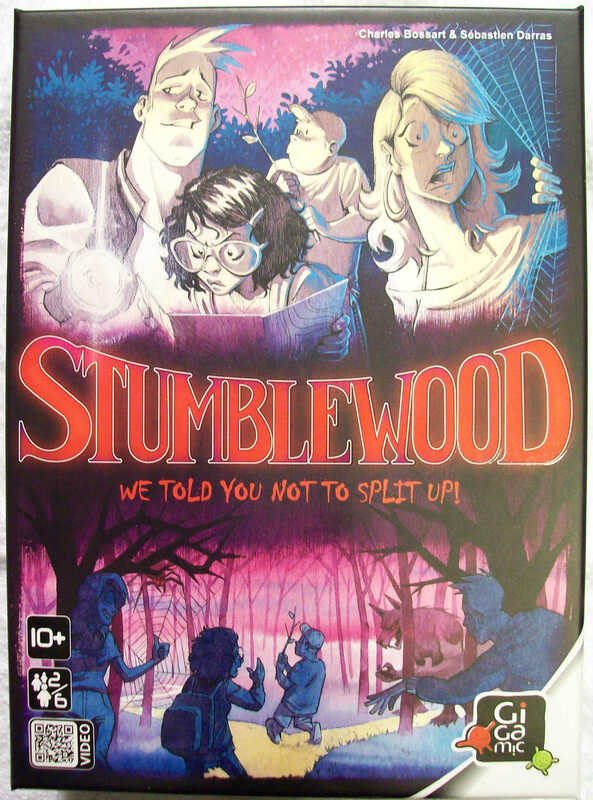 Stumblewood has clear rules, offers a definite challenge to the memory, and can be completed in a reasonable period of time. I’m not entirely sure why it wasn’t fun. There are other memory games I like. I think the main problem here is that you don’t get to actually exercise your memory in the first part of the game. On your first turn you’re playing randomly – completely so with respect to the traps and mostly so with respect to the path, which you can predict in some cases. Once you make a mistake you have to remember things, of course, but few adults will have a problem remembering a sequence of a few moves they made a few seconds ago. The game doesn’t start to get interesting until your second turn, but unless you got lucky the first turn it still won’t be that interesting since you won’t have gotten that far yet, so you replay a few moves and then have to start random play again. Eventually you have enough to remember that it’s actually challenging, but by that time people seem to get sick of it, which is not surprising considering how many times you have to run through the same sequence of actions. Good memory games don’t work like this: they either present you with a lot of information to remember up front or gradually build it up, but they don’t have a lot to remember but make you discover it randomly. The children’s game Memory does do this, but it’s aimed at very young children. I think Stumblewood would be better if the designers had taken a different approach, say giving everyone some hit point tokens, letting you see your card for a bit before going through it, docking you points for mistakes, and going through more cards until only one player is left. (Feel free to try this completely untested variant if you like.) As it stands I can’t recommend it. Joe Huber (1 play) – I actually do enjoy memory elements in games, making Stumblewood a fine candidate for me. But – while the memory element was fine, the rest of the game left a lot to be desired. Dan introduced me to another escape-the-maze game, Blind Alley, a few years back, and while there’s no memory element in that game it is a far better take on the genre, in my opinion, offering the opportunity for deduction and logical intuition in place of stumbling around blind until you’ve triggered all of the traps. Not for me… Dan Blum, Joe H.
This entry was posted in Reviews and tagged Gigamic, reviews. Bookmark the permalink. I was one of the victims in Dan’s first play. I think one of the chief fun-killers in this game is that you have a choice: either you can focus completely on remembering what you need to for your character, or you can focus on enjoying what the other players are doing and forget your own stuff. A game where in order to win you much eschew fun is not one I want to play.